Breaking down a genealogical ‘brick wall’ can be exhilarating but it often happens completely unexpectedly. A brick wall in any project leaves Angel Research always with a name in the back of your mind. We don’t always realize it but in every research we do we are always looking out for those names that stick in our mind. The brick walls of our clients. 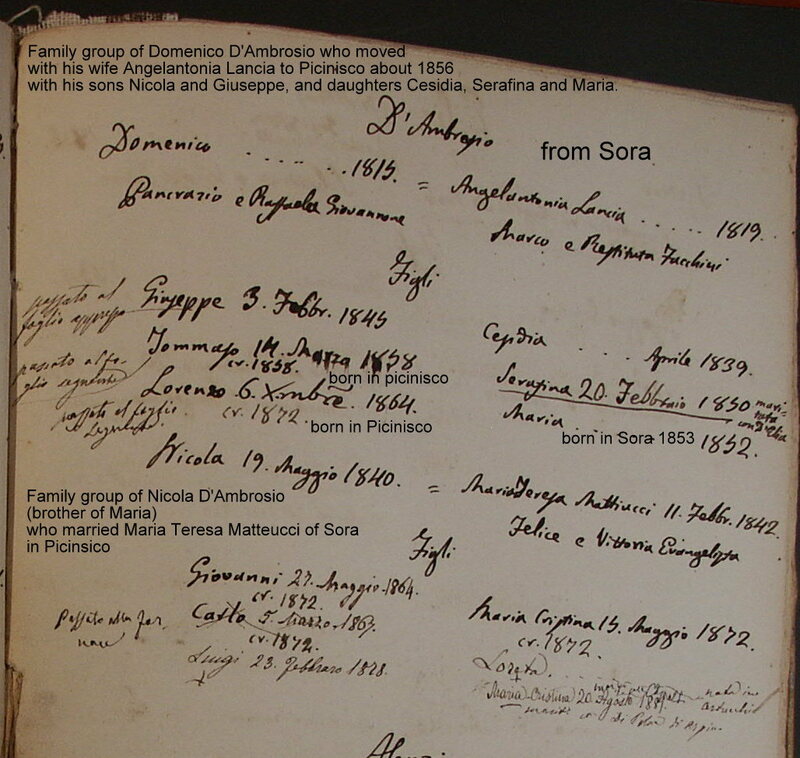 Maria D’Ambrosio was a big mystery to her descendants family. The story was that she was from the town of Sora, and certainly the surname is found there, but also in many other towns in the area. The registers in the town of Trasacco have no indexes and we were not allowed to search for a death record for her. Maria had arrived in a small town in Abruzzo at a time when it was booming with the draining of the Lago di Fucino. She may have gone there looking for work or perhaps she was already pregnant with her first child and sent there to deliver it out of the eyes of the local townspeople where she was raised. Whatever the reason, she stayed and raised her son Giuseppe and two years later had another child Andrea. Both children were registered without parents’ names but presumably returned to Maria for raising since they were known to each other. We did not know her age, father’s name or town of birth but according to the family she is said to be the mother of 5 or 6 children. She is not named on any of their birth records and only one bears the name of his father, although 3 of the children bear her surname. I think we can safely say she was the mother of at least 4 of the children, the 3 who bear her surname and the one (Michele) the father recognized and which she is named in the baptism record as the wife of Raffaele Colucci. One of the children (the oldest, Giuseppe) is not attributed to her except that one of them named him as a ‘brother’ when immigrating to America and he traveled with another of Maria’s children (Andrea) on his first voyage to America. There is a five year gap between the first two children born in 1876 and 1878 and the next three who bear her surname. If the town clerk was assigning these ‘abandoned’ children the surname of the mother it would indicate she had some means of support. She may have received money from the town to take care of the first two ‘abandoned’ children. Also interesting to note is that Raffaele Colucci had his last child with his wife in 1876. My feeling is that the first two children were not his but the rest were. He could not recognize officially them because his wife was still living, except for the last one, Michele who was born after his wife’s death in 1891. One of the daughter’s baptism records had the surname of her presumed father added later and Maria was also named as Raffaele’s ‘wife’ on the baptism record of the only child he recognized although we found no evidence of a marriage, civil or parish. Interesting to note that Maria’s first two sons emigrated to America but the next three who are presumed to be Raffaele’s children all stayed in Italy. Michele, his only official son with Maria emigrated in 1911 to join his brothers so I think we can safely say Raffaele died before that date. Although I had searched the Register of the Population in Sora which was created in 1865 I did not find a candidate for ‘our’ Maria. I had estimated her birth year as around 1850. If she was born in Sora she would have been only 15 years old in 1865 and should have been found in the Register of the Population created in 1861-1865. Without a death record for her we are backed against the wall especially since we do not even know for sure she died in Trasacco. Then a small breakthrough! While searching the parish census records of Picinisco, a small town about 18 kilometres from the town where Raffaele was from I noticed a D’Ambrosio family with a daughter Maria born in 1852. She was not marked deceased, or married. The priest who created this Stato d’Anime was very thorough. He indicated the origin of many families and although he had not marked this one as originating in Sora, it was included in the group that did originate from Sora and many of the surnames were Sora surnames. Looking carefully at the record I noted that Maria’s name had only a year of birth and no ‘cresima’ date while several of her siblings had full baptismal dates and ‘cresima’ dates. This indicated to me that the family had arrived in Picinisco between 1852 and 1858. I noted that all her siblings except her oldest sister eventually married in Picinisco and were producing children by 1899 when the census ceased to be updated. A later search of civil records in Sora produced a birth record for Maria in 1853. Is this the Maria we are looking for? We’ll never know for sure until we find her death record and maybe even not then. If she died in Trasacco it’s possible no one knew her well enough to know her parents’ names. Did she follow her ‘husband’ back to his town of birth? Did he ever marry her? I doubt it; otherwise he would have legitimized his other children I am sure. We know that 3 of her sons immigrated to America. One son moved to Rome and two daughters stayed in Trasacco and raised their families there. Maybe one of their descendants in Trasacco knows when and where Maria died?